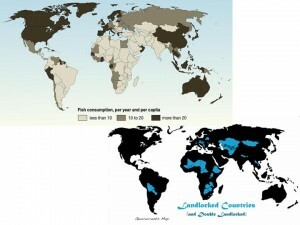 To follow up on my earlier post on the geography of milk consumption, let’s consider the global patterns of where and to what extent meat, poultry, and fish are consumed. As the map of worldwide meat consumption per capita posted on the left indicates, a significant gap separates “carnivorous” and “non-carnivorous” countries, as an average person in a country from the lowest category consumes 10 times less meat than a person from a country in the highest category, such the United States, Australia, New Zealand, or Spain*. 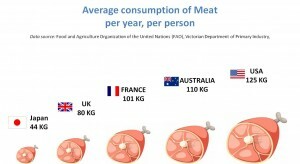 Overall, the Americas, Australia, and Europe consume more meat per capita than other parts of the world, though differences in consumption exist even within those large regions. For example, in South America, Argentineans, Chileans, and Brazilians eat more meat than Peruvians; similarly, Western Europeans consume more flesh than Eastern Europeans. With a few exceptions, Africa, the Middle East, South and Southeast Asia form the least carnivorous areas. It is often suggested that the levels of meat consumption correlate with the overall economic development of a given country. 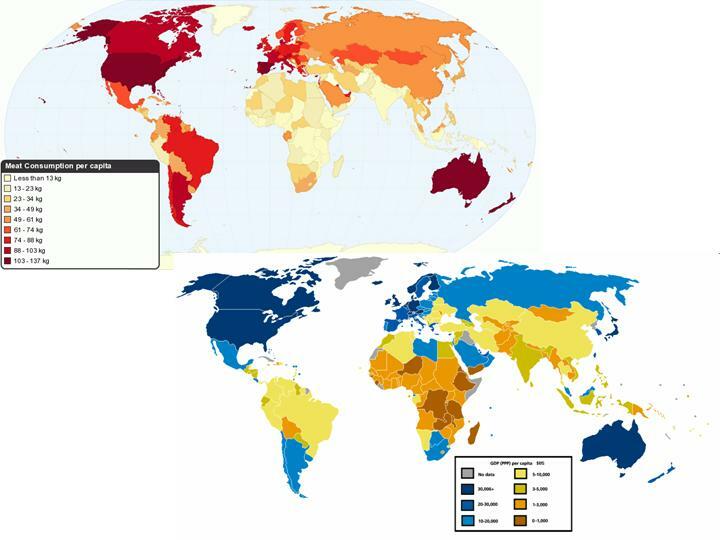 A juxtaposition of the meat consumption map (on the top) and the GDP per capita map (on the bottom) confirms such a correlation: people in richer countries can afford to consume more meat than those in poorer countries. However, discrepancies here are instructive as well. 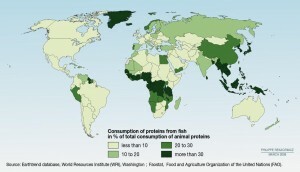 For example, Brazilians and Venezuelans consume far more meat than would be expected on the basis of per capita GDP. (My friend who lived in Brazil for 20 years speaks often of the meat-and-potatoes eating habits of her Brazilian in-laws.) Similarly, Gabon in central Africa consumes more meat than would be expected, as does Mongolia, where meat has always constituted a significant part of the diet. Turks, Romanians, and Belarusians too eat more meat than might be assumed on the basis of their GDP levels. Exceptions to the GDP/meat consumption correlation can be found in the opposite direction as well, with three clusters worldwide. First, relatively well-off South Africa and Botswana consume little meat. Second, Libya and Oman both rank high in terms of GDP, but have limited meat consumption; the wealth in those countries comes primarily from oil production and export and is therefore distributed quite unevenly, and the few extremely rich people can only eat so much meat. Finally, a significant number of countries with a high GDP but low levels of meat consumptions can be found in East and Southeast Asia. 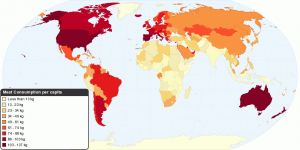 In particular, Japan, South Korea, Malaysia, Singapore, and Taiwan (treated by these maps as a separate country) consume less meat than would be expected based on their GDP. An average Japanese person eats only a third of the amount of meat consumed by an average American. This discrepancy clearly stems from cultural rather than economic factors. According to some scholars, the Japanese diet always relied mainly on grains, vegetables, seaweeds, and fish, with poultry and mammal flesh consumed in slight amounts. The advent of Buddhism placed an even stronger taboo on eating of “four-legged creatures”, which were considered unclean, something to be avoided by personal choice through the Edo Period. Some types of meat, however, such as the flesh of wild birds, hares, and whales, were regarded as acceptable. Red meat was popularized in the modern period, and dishes like shabu-shabu and teppan-yaki are commonly eaten in Japan today. Cultural practices are also the crucial factor in determining what types of meat are eaten in different places. As can be seen from the chart on the left, pork has been the most widely consumed kind of meat globally. Beef used to be a close second, but its relative prominence on the global plate has diminished greatly over the last half-century. Poultry, however, is consumed in growing quantities, both in absolute and relative terms, whereas the consumption of lamb, mutton, and other “miscellaneous” types of meat remains marginal yet stable. Yet this overall distribution of meat types does not hold everywhere: both Islam and Judaism prohibit the consumption of pork, and Hindus do not eat beef/veal, so the countries where these religions are widespread rely on other types of meat, or eat little of it at all. In fact, the only Muslim countries with relatively high overall meat consumption are the United Arab Emirates, Qatar, Saudi Arabia, and Kazakhstan. All of those countries, except Kazakhstan, have relatively high levels of GDP, which, as we have seen above, often correlates with higher levels of meat consumption. Kazakhs traditionally were herders who raised fat-tailed sheep, Bactrian camels, and horses, relying on these animals for transportation, clothing, and food. Mutton still predominates, but beef, horsemeat, goat meat, and even poultry are used as well. Because of their traditional nomadic lifestyle, the Kazakhs developed many ways to preserve meat products, such as sausages made from horsemeat (e.g. kazy), mutton fat, and even mutton liver. Other organ meats—lungs, liver, brains, tongue—are commonly used as well; kidneys are particularly valued. Also popular are dishes containing dough in combination with some type of meat: either flat, fettuccini-like pasta with pieces of meat (traditional Kazakh dishes do not use ground meat) or boiled, fried, or baked meat-stuffed pastas and pasties. 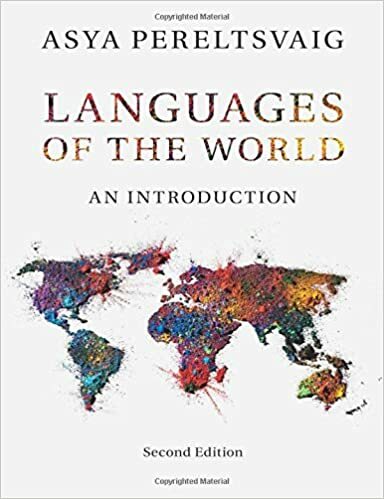 In contrast, in the New World beef predominates, particularly in the world’s top beef-eating countries: the US, Canada, Argentina, Brazil, Uruguay, Australia, and New Zealand. An average resident of those counties consumes over 70 pounds of beef annually. In contrast, an average Chinese, Moroccan, or Iranian person eats less than 15 pounds of beef a year. Curiously, Poles find themselves in the same low beef consumption category, as a lot more pork than beef is consumed in Poland. Europeans in general eat relatively more pork and less beef than North Americans (see the chart below). As can be seen from the chart on the left, beef is now less common on the American plate than poultry (mostly chicken). The popularity of chicken has been rising steadily, as the dietary concerns of many Americans are shifting from shortage of protein to excess cholesterol. In 1960, an average American consumed 25 pounds of poultry a year (including Thanksgiving turkey! ), whereas by 2000 this figure had grown nearly 3-fold. There is good reason why Americans joke about foods that “taste like chicken”. 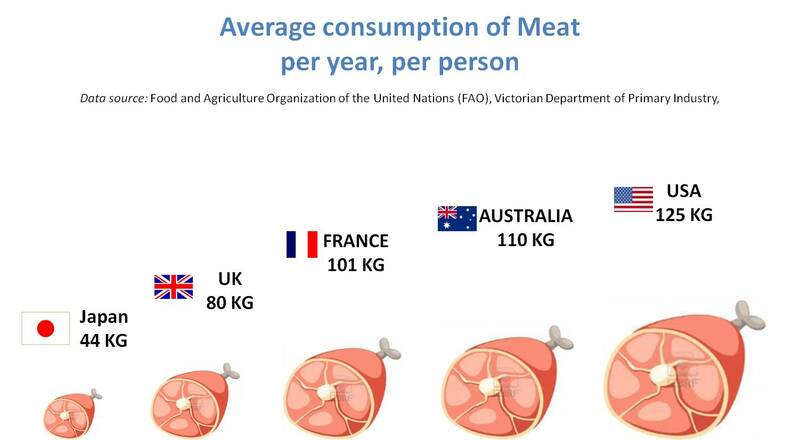 The same tendency is found elsewhere in the developed world, including Canada, the European Union, Russia, Ukraine, and South Africa; only Australians eat as much beef as poultry, by weight, as shown in the chart on the left. 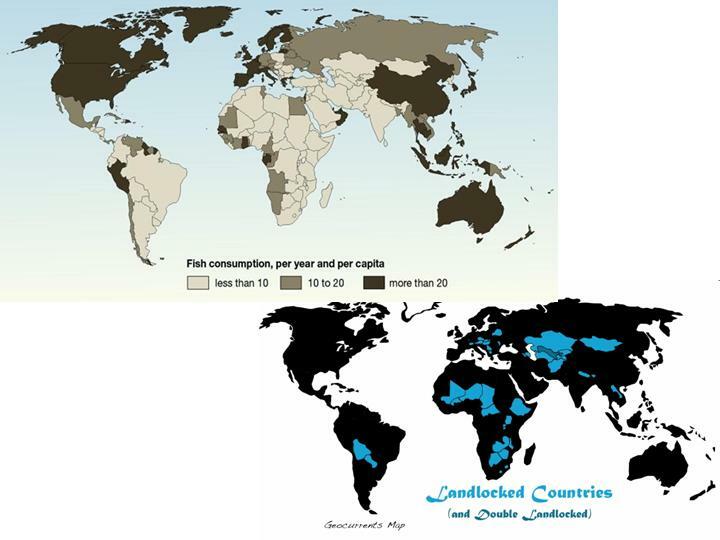 While the geographical patterns in the consumption of various types of meat are governed by cultural factors, the global patterns of fish eating (illustrated in the 2006 map from Food and Agriculture Organization of the United Nations, reproduced on the left) are even more strongly influenced by cultural factors. Even among countries in the top fish-consuming category in this map, there are significant disparities as to how much fish is eaten: according to the data from Food and Agriculture Organization of the United Nations for 2011, an average Japanese person eats three times more fish than an average American or Brit, while residents of Maldives eat nearly three times more fish than the Japanese. 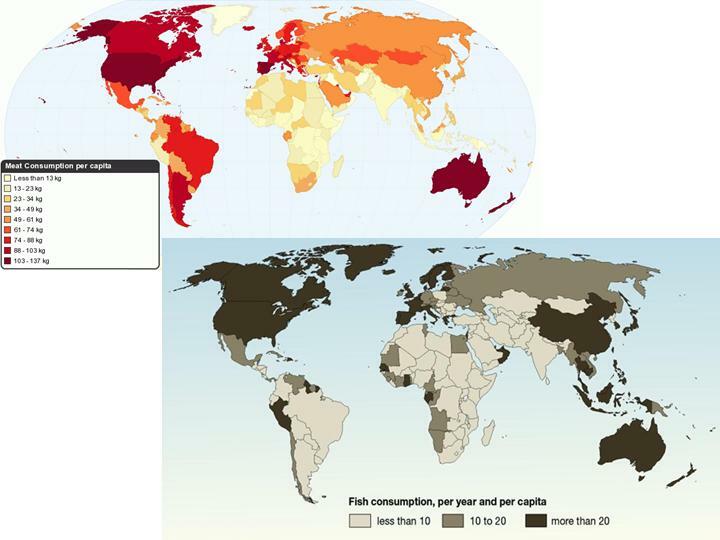 As can be seen from a juxtaposition of meat and fish consumption maps on the left, globally fish consumption does not complement or supplement meat consumption. Many of the countries in the top “carnivorous” category—United States, Spain, Australia, and New Zealand—are also in the top fish-eating category, consuming more than 20 pounds of fish per capita annually. Canada and most countries in Western and Northern Europe too consume a lot of meat, as well as fish. However, meat-loving Argentineans and Brazilians eat relatively little fish, less than 10 pounds a year. 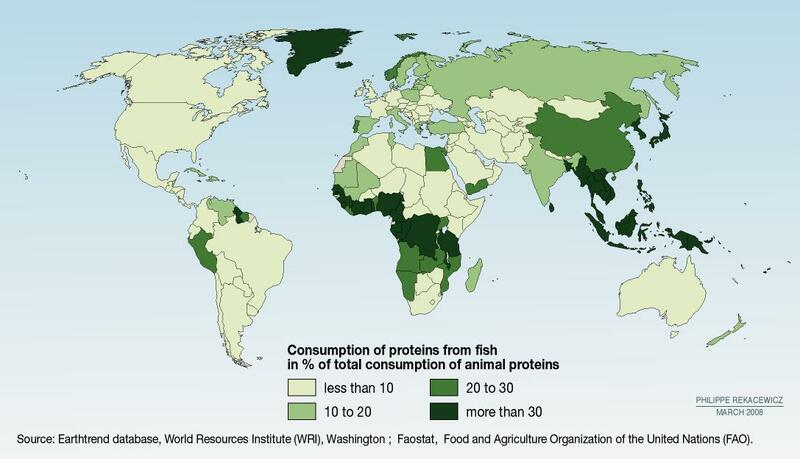 A somewhat different way to look at this is presented in the map on the left which depicts the percentage of animal proteins consumed in the form of fish. This map highlights the important role that fish plays in East and Southeast Asia, as well as in West and Central Africa. While people in this African region consume much less fish in absolute per capita numbers than those in the Asian region, fish is just as important a source of nutrition for the Congolese and the Tanzanians as it is for the Japanese or the Indonesians. 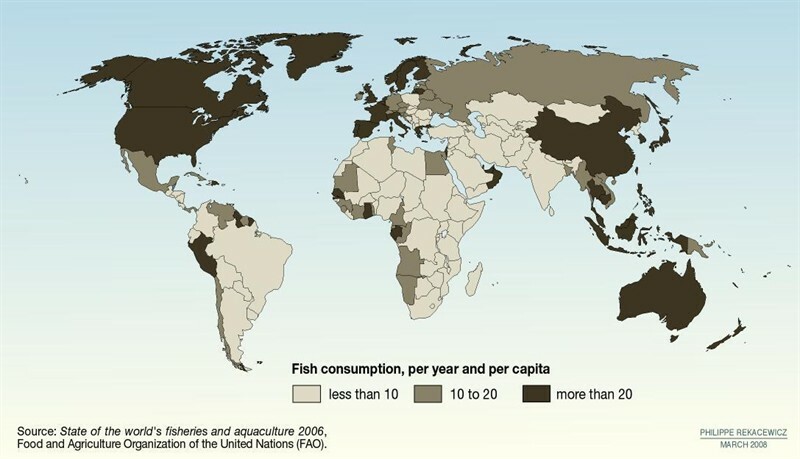 Predictably, most of the world’s landlocked countries fall into the least fish-eating category, with the exceptions of Laos, Belarus, Czech Republic, Austria, and Switzerland, which consume between 10 and 20 pounds of fish per capita annually. Laos finds itself in the East and Southeast Asian fish-eating block, where large amounts of sea and fresh-water creatures are eaten, partially for economic reasons (especially by poorer populations) and partially for religious reasons (as discussed above, Buddhism regards fish as much more acceptable than the flesh of warm-blooded creatures). The role of cultural factors rather than merely availability and costs in determining how much fish is consumed is particularly clear if we consider European countries. Moving from west to east, peoples of Atlantic Europe—Portuguese, Spanish, French, the Dutch and the Brits—as well as Scandinavians, Italians, and Greeks predictably eat a lot of fish. Even within those countries, fish is more popular in coastal areas and port cities, such as Galicia in northwestern Spain and Venice, who cuisine is based on sea creatures from the Venetian Lagoon. 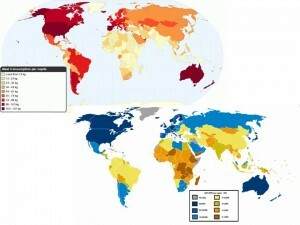 Peoples of Central Europe, particularly the Germans, Austrians, and Czechs find themselves in the medium category. But peoples of Eastern Europe outside the former Soviet Union—Poles, Slovaks, Romanians, and the South Slavs—eat the least fish. Baltic- and Slavic-speaking peoples of the former USSR are again in the medium fish-consumption category (except Lithuanians who eat more than 20 pounds of fish annually), while in other former Soviet republics fish consumption is low. Thus, landlocked Belarus consumes more fish than Baltic-facing Poland, and landlocked Switzerland more than Albania on the Mediterranean coast. Unfortunately, it is not clear what is included in the “fish” category, and figures may differ significantly depending on whether shellfish and other types of non-fish seafood are included. 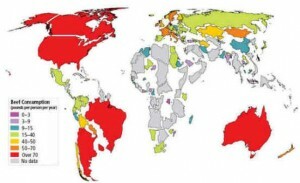 Presumably, freshwater as well as saltwater fish are counted; otherwise the high-consumptions levels found in such poor, landlocked countries as Laos and Belarus would be inexplicable. In Russia as well, freshwater fish is still extremely important; saltwater fish became common only during the Soviet times. Traditionally, freshwater species such as sturgeon, pike, eel, carp, ruffe, zander, Coregonus, and European perch, were most commonly eaten, which is easily explained by the fact that Russia was landlocked for most of its history; numerous wars were fought by Russia over access to sea. The only group that had regular access to saltwater fish were the Pomor, who both fished at sea and bought fish from Norwegians. Traditional Russian fish dishes include fish soups (e.g. ukha and solyanka) and fish in aspic, as well as fish that is boiled, steamed, stewed in sour cream, baked whole or fried in batter. Fish stroganina is commonly eaten in Siberia. Though it has become very common in the last several decades, smoked fish was not traditionally eaten before the Russian Revolution. Elsewhere, countries that consume large quantities of fish include Peru, Guyana, and French Guiana in South America; Gabon, Ghana, and Senegal in Africa; Oman, United Arab Emirates and Qatar in the Gulf region. More generally, countries along the western coast of both South America and Africa consume more fish than their counterparts along the eastern shores, regardless of GDP or meat consumption patterns. To some extent, this is a feature of ocean currents, as the Humboldt Current off the west coast of South America and the Namib Current off the coast of southwestern Africa produce particularly rich fisheries. The final set of maps focuses on the United States. 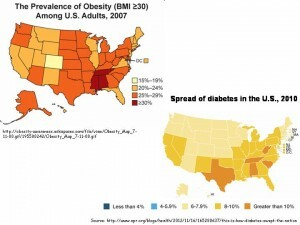 As can be seen from the top map, “carnivorous” eating habits are not distributed evenly over the country. The most meat per capita is consumed in central Texas, urban California, the Chicago metropolitan area, northern Georgia, and in the mid-Atlantic area. While overall meat consumption tends to correlate with urban areas, city dwellers in the Pacific Northwest—particularly, those in Portland and Seattle—eat much less meat; Bostonians eat even less. 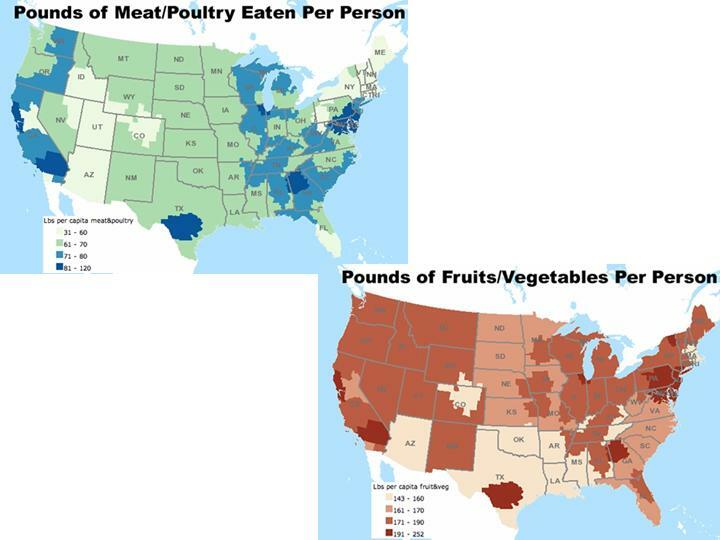 While I was unable to find a corresponding fish consumption map, it is interesting to compare the US meat/poultry eating map with that of fruit and vegetable consumption. The same areas where most meat is eaten also consume the most fruits and vegetables, over 190 pounds per capita per year. While some of the fruit/vegetable consumption patterns are explained in part by the geography of agriculture, I am particularly surprised as to how little fruit- and vegetable-based food is eaten in the U.S. South, where many crops in this category can be easily grown. 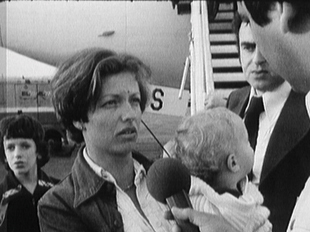 Yet again, cultural features play a prominent role. But maps of dietary habits can help explain some of the spatial patterns of obesity and diabetes in the United States, as seen in the maps on the left, which are based on recent CDC data. 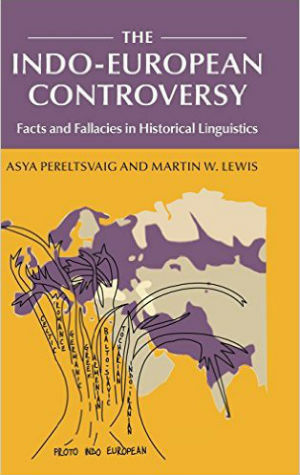 * Unfortunately, the maps reproduced here do not indicate the year in which the data were gathered, but since all pertain to the last decade, interesting conclusions can be drawn.